Lessons-Adventure-Excursions and Activities with a huge Fun factor. Who has never dreamt about building a raft and rowing it across the river with mates? Fight a race on a dragon boat against another team? Learning how to survive alone in the wilderness? Mastering the bow like Robin Hood? Just to mention a few. Our Adventure camp is located about 1 km away as the crow flies from the famous Corfe Castle, the fortification ruins of an old castle from the 11th century. The camp spans approximately 10 hectares on the edge of a forest on high ground, which overlooks the port of Poole Bay and Bournemouth. Here our Cavendish students not only have fun and improve their English skills but also learn teamwork, survival skills and self-confidence. Dragon boat racing – In the dragon boat race, team ‘A’ battles against team ‘B’ to find out who can occupy the uninhabited island in the middle of Poole Bay. Abseiling – is truly an unforgettable experience. 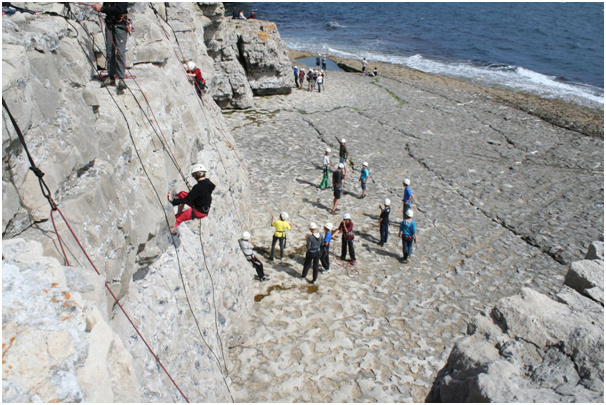 Abseiling takes place on a bluff above the beach. Of course, safety is always our highest priority and students are sure to gain confidence and overcome any fears. Everyone is always double-secured and is carefully guided. Climbing wall – Here the participants can showcase their skills on a 15m high climbing wall while secured with climbing rope. Students work out how they could actually climb a 5m high wall which is completely smooth. We show how it is possible to succeed as a team. Archery – Trained archery coaches explain and show how to properly deal with a bow and arrow. Who will be the next Robin Hood? Air rifle shooting – This activity involves using lightweight air rifles. It is an excellent activity to develop concentration and coordination skills. Pioneering – like the old pioneers in the Wild West. Armed only with ropes and tree trunks, young people are assigned various tasks such as an obstacle course, under expert supervision. Camp-craft – Craft activities that utilise natural materials and help to improve artistic skills which proves enjoyable and rewarding. Raft building – The participants explain how they can build rafts from the simplest of means to cross a river. For example; who gets to the other side first without getting wet? Canoeing – In teams of 2 to 4 young people, a wet race can be fought here in the Bay of Poole. Initiative Exercises & Survival skills – How do I make a fire? Build a shelter and find food? Who knows. This information could be vital one day. Low & High Rope course – on the largest high ropes in Europe. There is a suspension bridge to a 45 m high parachute landing simulator – here courage is required. As always, we insist on safety and protection! Students are free to choose whatever activity they want to do: Anyone can, but it’s not obligatory if you need to sit out and watch first. 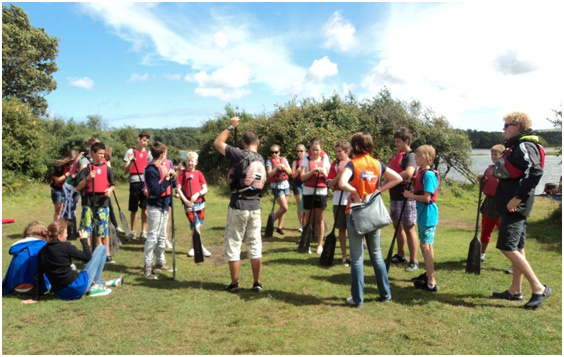 Orienteering – Participants are given a map and a compass and work as a team, as quickly as possible to reach the goal. Here, students are trained in navigation and map reading the fun way. Students are free to choose whatever activity they want to do. Anyone can, but nobody has to – There is isn’t any pressure. All employees of our adventure camps are qualified and experienced professionals. All equipment on the premises of the camp is regularly checked according to European safety standards. Classes are conducted by qualified (minimum CELTA) English Language teachers. The 40 lessons (40 minutes/lesson= 26.7 hours) English tuition in small groups (average 2011: 13.7) are a good way to apply the language skills and deepen them. The program includes numerous activities with full and half-day excursions. Students will be accompanied by experienced English guides. Full-day excursions to London include sightseeing and we provide enough free time for students to do their shopping. Excursions to Salisbury include a visit to the tallest Cathedral in England (with the second largest spire in England) and the original version of the Magna Carta, the first written Constitution in the world. Also,a trip to Stonehenge, the world famous Celtic place of worship. For those interested, free time for further consideration of the stones is granted (for a fee).Trips to Bournemouth to the beach or shopping involve hiking and swimming on the sandy beach. When it is not ideal beach weather, there are other options available, like sightseeing the town from a balloon, exploring the exciting underwater world of the Oceanarium or a visit to Russel Coats, an old English house / museum set on Bournemouth cliff top. There are also excursions to Durdle Door and Lulworth Cove (here are many exterior shots of the Rosemunde Pilcher movies) along the Jurassic Coast cliffs, where you can still find real fossils from the Jurassic period. The highlight of the trip will be the visit to Corfe Castle, the fortified ruins of an old castle from the 11th century. After visiting the castle we ride with an old steam locomotive train to Swanage, a beautiful place on the Purbeck coast. Evenings are filled with various voluntary activities. There are games evenings, cinema, disco, night walks, football tournaments or murder mystery evenings and bonfire evenings – for sure it will be exciting! If students still haven’t had enough between classes, meals, tours, activities and the evening entertainment, they can always find something else to do at the campsite. Huge grassy areas invite students to play with a ball, try table tennis, or a forest that invites them to explore. If students just want to relax they can lounge with the TV to chill out – all of that in the safest and most beautiful location. 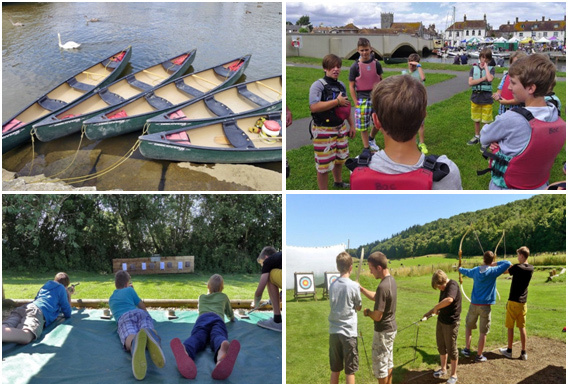 The language and adventure camp is recommended for students aged between 11-16 years. The participants stay in 2-6 bed rooms (mostly 4-bed rooms) inside is very rustic, a typical English cottages from the 18th century. Accommodation is available in three adjacent buildings. All meals are included (breakfast, lunch and evening meal).